Discussion in 'Homebrew and Kit Projects' started by WB0RIO, May 8, 2015. 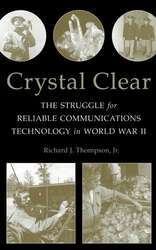 This book goes into great detail of the WW2 efforts to obtain and process crystals. That wore me out just watching it, I couldn't imagine doing that all day. I can never manage to get more than a dozen or so crystals sorted at a go, and I don't have to deal with all that mess. No wonder they used to be so damned expensive. I hope they paid those ladies a LOT. Brutal combination of tedious AND super highly skilled labor. I don't think you could find an army of techs like that these days. The "frequency etch" by the way, is hydrofluoric acid. Notice the lady's bare hands dunking those crystals in that. Fascinating. I had a friend who would cut his own crystal blanks and grind them to frequency(he was a jeweler and had the saws etc). I had several of his crystals for my HW-16 back in the 70's. By the way...THANKS....that was a fabulous flick. This sort of thing should be required viewing for every engineering student. And every politician, for that matter. Most folks have no clue what it takes to actually DO anything these days. Fighting a war with rocks? Sure beats painting watch dials. I hope they paid those ladies a LOT. They did. It may not seem like a lot in today's dollars but it was a lot more than they had been making in peacetime. Brutal combination of tedious AND super highly skilled labor. Which is why they were paid well. I don't think you could find an army of techs like that these days. Remember that in those days employers would hire people with no skills and train them to do a specific job. They'd be paid while being trained, and supplied with whatever was needed. Those who got through the training course got the jobs. Jobs that paid very well, had good benefits, and contirbuted something to the war effort. Those who washed out of the training got other jobs. Remember too that there was a World War going on. Those folks you see working in the film almost certainly had brothers, sons, fathers, uncles, cousins, neighbors, and loved ones off fighting - and dying. They all knew exactly who the enemies were and what it would take to beat them. They all knew that our Allies in places like England were being bombed every night, and that other Allies in places like France and the Phillipines were enslaved by the Axis - who would enslave US if we gave them the chance.